U.S. Rep. Neil Abercrombie said yesterday that a collapse of leadership in Hawai'i has motivated him to resign from Congress and return in a matter of weeks to campaign full time for governor. With key legislation on health care reform, military spending, the Akaka Bill and other issues expected to come before Congress in the coming weeks, U.S. Rep. Neil Abercrombie says he will complete work on those matters before resigning his seat. U.S. Rep. Neil Abercrombie on Sunday confirmed his plans to resign from Congress, but remained vague on when he will leave. On Jan. 1, Hawai'i will join the ranks of about a dozen states that have e-waste recycling programs. The cost of already-pricey Hawaii could soon get higher.Lawmakers are considering a hike in Hawaii's version of the sales tax. Thousands of runners took part Sunday morning in the fourth largest marathon in the nation. Billy Kenoi is a man of contradictions. Federal money going to a North Kohala land conservation project will be used to purchase 17 acres, several state groups announced Friday. Hundreds of new homes would be built in Lanai City under an affordable housing project proposed by the county for development over 17 years. In what appears to be a blow to East Maui Native Hawaiian taro farmers and environmentalists - and a potential much-needed win for struggling Hawaiian Commercial & Sugar Co. - the state Commission on Water Resource Management staff has recommended that water diverted by HC&S be restored to only one of the 19 streams it uses to irrigate its sugar crop. 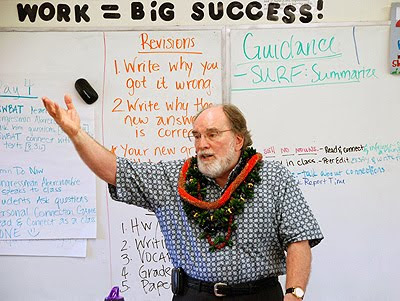 Unlike public school students across the state, those at Hana High and Elementary School have not lost classroom instructional time because of Furlough Fridays.